India among top 10 in private wealth: Report. India is among the top 10 nations in terms of total private wealth held, but at the bottom in terms of per capita riches, says a report. New Delhi : India is among the top 10 nations in terms of total private wealth held, but at the bottom in terms of per capita riches, says a report. According to the report by New World Wealth, India's total individual wealth stood at $3,492 billion, while the United States, which topped the list, had a total individual wealth of $48,734 billion. Total individual wealth refers to the private wealth held by all the individuals in each country, including all property, cash, equities and business interests. 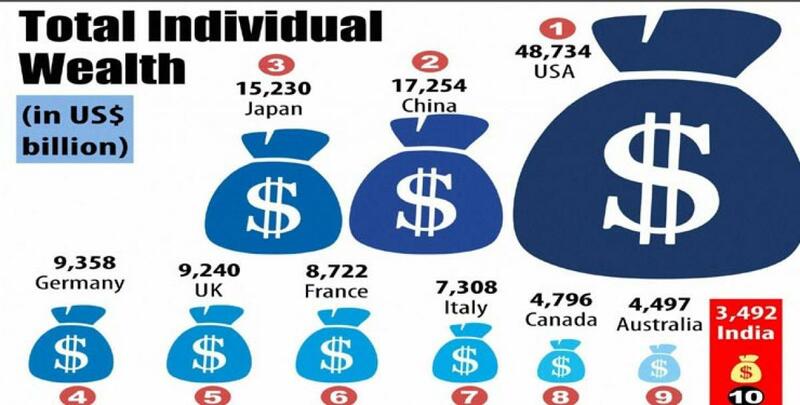 Others in the top 10 in terms of total individual wealth include, China at the second place with $17,254 billion, Japan ($15,230 billion), Germany ($9,358 billion), United Kingdom ($9,240 billion), France ($8,722 billion), Italy ($7,308 billion), Canada ($4,796 billion), Australia ($4,497 billion) and India ($3,492 billion). On per capita basis, India was last among the 20 countries, as the average wealth per person stood at $2,800, while that of Switzerland, which topped the ranking, stood at $285,100. "As reflected, certain countries such as India and Indonesia, only make the W20 (wealthiest 20 countries in the world) due to their large populations. On a per capita basis, they are quite poor," the report said. It further noted that in terms of wealth growth since 2000, India fared much better. It was ranked 5th as its per capita wealth has grown from $900 in the year 2000 to $2,800 in 2015, registering a growth of 211%. Other countries in the top five in terms of wealth growth include, Indonesia, which saw growth of 362% in wealth, China (341%), Russian Federation (253%) and Australia (248%). New World Wealth provides information on global wealth sector, with a special focus on high growth market.